The Wembley series comes to an end with the focus turning to the man at the top during arguably the greatest day in the club’s history, Ian Atkins. Akins led the Cobblers to Wembley in two successive seasons in 1997 and 1998 and gave us some of the best memories of recent times during his reign. No one looked happier than the Brummie boss on the final whistle, as he charged onto the pitch to join in the celebrations. A lot has been said about Atkins’ long ball tactics and “ugly” football but you can’t complain about the effectiveness of his management during his time with the Cobblers. Atkins’ managerial career began in 1990 at Colchester United, where he was in temporary charge for just three games. In 1992, he took over at Cambridge United but spent just six months with the U’s. 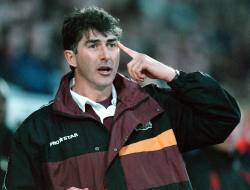 Atkins joined the Cobblers in 1995 following a stint with Doncaster Rovers and immediately turned around the fortunes of the fledging Town. In his first season with us, Atkins took us to 11th place before taking us to Wembley just one season later. After the playoff final of 1997, Atkins worked miracles to take us back to the famous stadium just 12 months later in the Division Two (League One) playoff final. Unfortunately, that was as far as Atkins would take us and the following season we were relegated before Atkins’ departure in October of 1999 with the team stuck in mid-table of the basement league. He quickly returned to management though and joined Chester City for the end of the same season. Atkins then went on to manage Carlisle United, Oxford United, Bristol Rovers and Torquay United. More recently, he has been co-commentating on BBC Radio Northampton’s coverage of Cobblers home games and was even rumoured to be in the frame to take over at the club again last December following John Gorman’s exit! Atkins managed the Cobblers for 248 games in total, leading us to 89 victories, 87 draws and 72 defeats. This entry was posted in Uncategorized by aloadofcobblers2011. Bookmark the permalink.